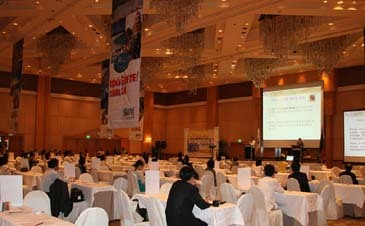 The 2nd Philippine-Korea Travel Exchange (PhilKoTex) held on March 13, 2008 at the luxurious Sofitel Philippine Plaza in Manila. Several years ago South Korea beat USA as the No. 1 tourist nation visiting the Philippines. Last year alone over 630,000 Koreans entered the Philippines. All Filipinos — government officials, tour and travel agents, even lay people seem eager to woo even more visitors from the formerly poor Land of the Morning Calm. "Last year's arrival statistics breached the 3 million mark for the first time in our history, and Korean travelers accounted for 21% of that number," said Ms. Maricon Basco-Ebron in the opening speech at the 2nd Philippine-Korea Travel Exchange (PhilKoTex) held on March 13, 2008 at the luxurious Sofitel Philippine Plaza in Manila. The one-day event was arranged by the Department of Tourism (DOT) of the Philippines as part of its effort to draw more South Korean tourists. Ms. Basco-Ebron, who serves as director of DOT's Seoul office, also acts as tourism attache at the Embassy of the Philippines in South Korea. She said that for the second year in a row, South Koreans topped all other markets. 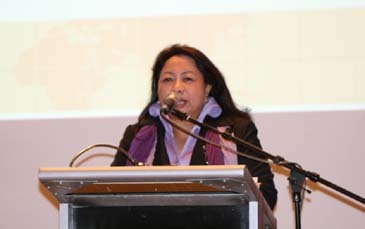 Ms. Maricon Basco-Ebron is making opening speech at the 2nd PhilKoTex at Sofitel Philippine Plaza in Manila on March 13, 2008. She serves as director of DOT's Seoul office. She also acts as tourism attache at the Embassy of the Philippines in South Korea. "We must work hard to remain in the number one spot, which is the key reason why this market-specific event was created in the first place," she said. "The PhilKoTex was an opportunity for the major destinations and attractions of the Philippines to be shown in depth." "In a nutshell, we have 54 hotels and resorts, six tour operators, an airline, two government agencies, and one convention/exhibition venue," exclaimed the tourism director. "Meeting our dear sellers today are 74 buyers representing many of the top travel organizations in Korea." The travel exchange gathering attracted over 70 Korean tour operators and a dozen journalists from South Korea. They engaged in business meetings with local sellers throughout the day. "Another aspect of the event was to upgrade both South Korea's and the Philippines knowledge of each other," Ms. Ebron said when asked about the benefits of the biennial PhilKoTex gathering. The first PhilKoTex was held in 2006. "A major concern of the Department of Tourism with respect to South Korea is to continue to learn about their respective cultures and customs, so they can promote each other's attractions" she added. Ms. Malyn Manangan, sales account executive of Pearl of The Pacific gave an interview to The Seoul Times at the 2nd PhilKoTex at Sofitel Philippine Plaza in Manila on March 13, 2008. A variety of resorts and spa representatives of the Philippines were seen at the convention showing just what the Philippines 7107 island's had to offer. Amongst them was Ms. Malyn Manangan, sales account executive of Pearl of The Pacific. She said she was new to the PhilKoTex. As the sales executive of a resort and spa in Boracay, she knows all too well the need to develop Filipino and Korean relations. Last year, South Koreans accounted for 65% of Boracay's visitors. Resorts like her Pearl of The Pacific thrive off Korean visitors. "An event like this is a great way for me to promote my resort and to deal with Koreans directly" said Ms. Manangan. She acknowledges the cultural differences between South Korea and the Philippines. She said the PhilKoTex was "a lesson in patience and ultimately opened up my mind." A reception and dinner followed the convention. During the dinner entertainment was provided by young but exceptionally talented "Playshop Kids." They are no strangers to Koreans as they performed in South Korea in 2006 at the Korea World Travel Fair (KOFTA) where they won the "Best Folklore Performance Award." Assistant Secretary of DOT Cynthia Carrion gave closing remarks about the event. She noted that "the Philippines would like to stay on top of the tourism industry." 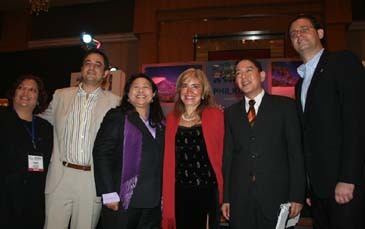 Assistant Secretary of DOT Cynthia Carrion (3rd from right) poses with other DOT officials during the reception of the 2nd PhilKoTex at Sofitel Philippine Plaza in Manila on March 13, 2008. To her left is Ms. Ebron. One of the key factors of the Philippine's success in hospitality is due to the spa resorts. "Our well-known hilots (Filipino traditional massage) have become one of our alternative and health care modalities," claimed Ms. Carrion. "We also have some of the world's best spa retreat resorts." The members of the Korean delegation were provided with some hands-on experience of the new seven "off-beat" destinations that the Department of Tourism is now promoting. They were split into seven groups and were given arranged tours around the country, including the hidden north Banaue, extremely hot Bicol, soulful Bohol, pristine Davao, the beautiful shores of Dumaguete and Sumilon, the last frontier of Palawan and Subic. By taking on the role of a tourist, Koreans in the media and those involved in the tourism industry just what these areas have to offer and to get a taste of Filipino hospitality and to gaze upon the islands unique sights. Both South Koreans and Filipinos benefited from the event. The PhilKoTex was a testimony to both nations' commitment to further develop their relationship and to enhance each others' knowledge of their respective cultures.